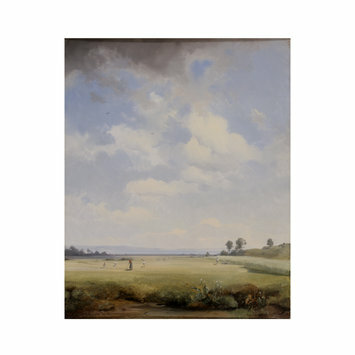 A painting with figures haymaking in an extensive landscape, with a towering sky above. The Rev. C. H. Townshend by 1854-56, when it was seen in the dining room of his London house by G.F. Waagen. Listed in the 1868 post-mortem register of the contents of Townshend's London house (V&A R/F MA/1/T1181) in the 'Fossil and Mineral room' as by A. Zimmermann; Bequeathed by Rev. Chauncey Hare Townshend, 1868. Ref : Parkinson, Ronald, Catalogue of British Oil Paintings 1820-1860. Victoria & Albert Museum, HMSO, London, 1990. p.xix. Historical significance: Zimmermann had a brilliant technique and excelled at light effects and spontaneous effects of nature. Following the example of Eduard Schleich (see V&A no. 1569-1869), scenes of harvesting and haymaking were a popular genre of the Munich school (See Wichmann, Meister, Schueler, Themen. Muenchener Landschaftsmaler im 19. Jahrhundert , Herrsching 1981, pp.166-175). 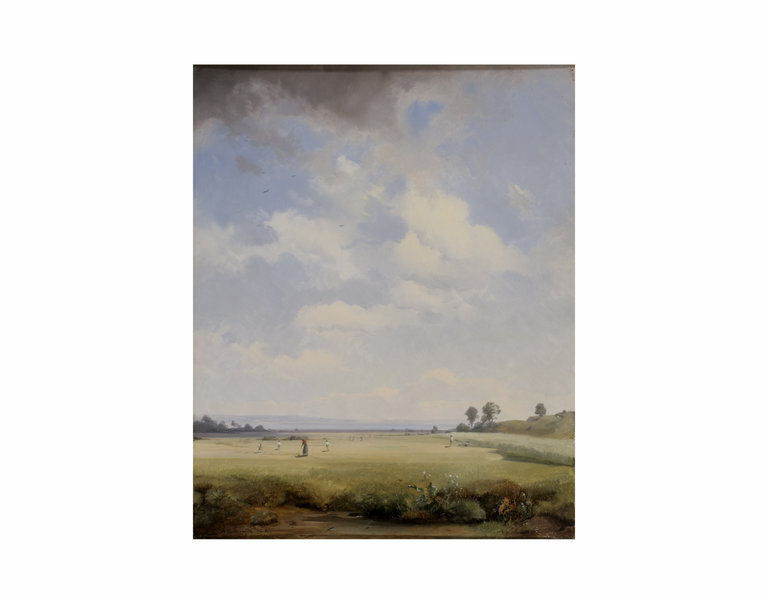 In this early work, painted at Munich in 1838, Zimmermann set the canvas on one end in order to paint a towering sky-scape, reducing the land to a narrow strip at the bottom of the composition. The sharp focus of such landscapes and the emphasis upon the sky seem to have been especially congenial to the Rev. Chauncey Hare Townshend, who became a major early patron of landscape photography, and particuarly of the French photographer Gustave le Gray, who excelled in seascapes with extensive skies. Townshend owned a number of such photographs, including one in an unusual vertical format (V&A no.68.003). Albert August Zimmermann (1808-88) was born at Zittau in Saxony. His brothers Max Richard and Robert Zimmermann were also painters. He studied at the Academies in Dresden and Munich. In 1857 he was appointed by the Austrian government to a professorship at the Milan Academy and from 1860 to 1871 he taught at the Academy in Vienna. 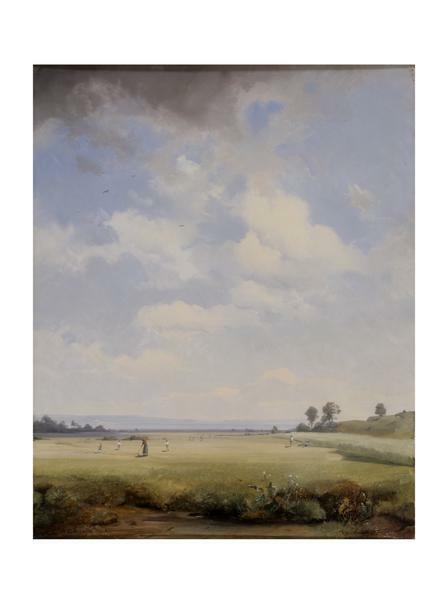 He painted mainly landscapes in a naturalistic style. The term ‘Biedermeier’ refers to bourgeois life and art in Germanic Europe, an extensive area embracing such cities as Copenhagen, Berlin, Vienna and Prague, from 1815 (the Congress of Vienna) to the revolutions of 1848. Biedermeier painters were ideologically opposed to academic and religious painting and favoured such subject matter as portraits, landscapes and genre scenes, with still-lifes, especially of flowers. They share a similar technique in the use of separate, clear tones and a high degree of finish, reminiscent of Neo-Classicism while they tend to convey a greater sentimentality. By the 1880s, the influence of this artistic movement was on the wane and was even used pejoratively to characterize the reactionary bourgeois elements in society, which remained quite indifferent to social problems and cultivated a sense of order and sobriety, especially in the private sphere and the domestic realm. Kauffmann, C.M. Catalogue of Foreign Paintings, II. 1800-1900 . London: Victoria and Albert Museum, 1973, p. 105, cat. no. 230. Siegfried Wichmann, Meister, Schueler, Themen. Muenchener Landschaftsmaler im 19. Jahrhundert , Herrsching 1981, pp.72-4, 77, 104, 146-7, 149, 167, 256, 266, 270, 272, 275. Gustav Friedrich Waagen, Galleries and cabinets of art in Great Britain : being an account of more than forty collections of paintings, drawings, sculptures, mss., &c. &c. visited in 1854 and 1856, and now for the first time described : forming a supplemental volume to the Treasures of art in Great Britain. London : William Clowes and Sons, 1857. p. 178.